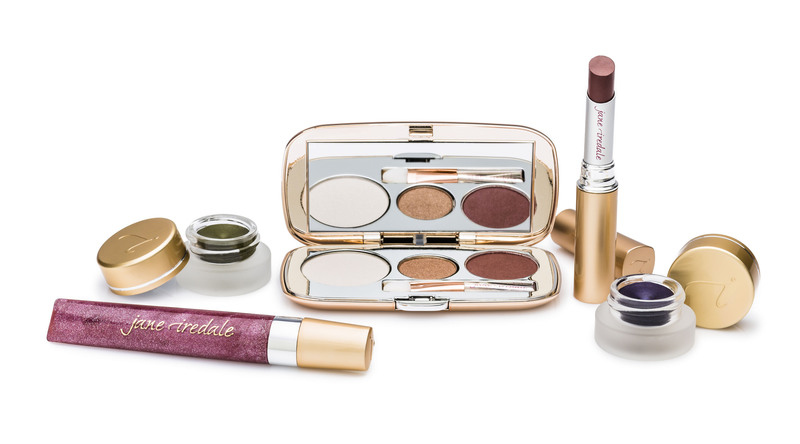 About five years ago, I, Maralyn, was introduced to Iredale Mineral Cosmetics when I had a facial in Rockland, Maine. The RN/esthetician did a wonderful job convincing me, I had to try them. After starting out simple, I have increased my use of the product line..
Sherrie is allergic to many cosmetics, so I was eager for her to try these products with their potential for our Luxe Beat reader. However, we wanted to tell you more than our experience, we wanted to share the story of the founder and President of Iredale Mineral Cosmetics, Ltd. So we asked for an interview. Maralyn: How did your interest grow in developing a simple and healthy line of cosmetics? Jane:I never knew what I wanted to be when I grew up, but along the way I picked up all kinds of unrelated experiences that finally came together to equip me for my present career. I had a career in the entertainment industry in Los Angeles, but eventually got show-biz burn-out. What I’d always wanted to do was to be involved with something that would enhance the lives of women and have some healing aspect to it. I’d seen the bad effects of makeup when I worked with actresses and models as a casting director and as a producer, so it suddenly occurred to me that there was a place for makeup that was good for the skin. I’d spent so many years working with women whose careers depended on having a flawless complexion, and the heavy makeup they were using to cover up skin problems was actually aggravating their skin concerns, instead of improving them. I started thinking about a solution – a makeup with true skin care benefits. I have always been interested in fashion, in wellness, in beauty, and in personal expression, so the leap into makeup was a very natural one for me to make. Maralyn: Was it a difficult challenge to develop products that were a combination of foundation, powder, concealer and sunscreen and yet good for the skin? Jane: It has been challenging to stick to our mandate of producing as natural a makeup as possible and at the same time satisfying the consumer who wants variety and innovation. Sometimes it’s really hard to give her what she wants without compromising our formulas. It’s easy if you’re free to use anything that’s out there but we’re not. Our consumers vet our ingredients with a magnifying glass. And they ask questions; for example I was asked once if the green tea extract we had in one product was caffeine-free. Once you declare your company’s intention, then you will be held to it because today we don’t own our brands, the consumer does. Sherrie: How long did the development take and were there a lot of road blocks? Jane: Our biggest challenge has been dealing with growth when we were massively under-capitalized. I used to think that growing was easy. When you sold more product, you made more money and, therefore, could buy more raw materials. How naïve was that?! I had no backers, no mentors, but I did have a boyfriend, now my husband, who was a banker. We used to strategize every waking moment on how to get more capital into a business that was a lowly start-up. We’d grit our teeth and go to friends and family and pull together enough money to get us through the next phase and on it went. We kept hearing the same refrain, “It’s hard when you’re a start-up.” After ten years and exporting to 25 countries, I asked my accountant, “When do we stop being a start-up?” Finally, we got big enough to obtain a Small Business Loan and then finally a bank took us seriously. Maralyn: What were the first group of products to kick off your line and why? Sherrie: What is the advantage of mineral makeup over conventional foundation and powder? Jane: The benefits of mineral makeup are impressive. Minerals allow the skin to breathe and function normally – a boon to all skin types, but especially for those who are sensitive or suffer from acne or Rosacea. Women frequently seek options to cover what they consider to be visually frustrating conditions like acne, Rosacea and hyperpigmentation. Regrettably, they often make choices that are not effective and potentially make the problem worse. Mineral makeup is a healthy, skin-friendly alternative to traditional makeup. Mineral makeup not only provides superior coverage, but it is also UV protective, non-comedogenic and calms redness. Furthermore, if it’s a good mineral makeup, it’s devoid of ingredients that sensitize the skin and cause problems such as blocking pores. True mineral makeup should have protective qualities such as sun protection and antioxidants. It will appear light on the skin but also give excellent coverage. We do far more testing on our products than is required. All of our products are tested for comedogencity, sensitivity and phototoxicity. They are also dermatologist and clinically tested. You can trust them. But not all mineral makeup is created equal. It’s important to look at the ingredients and the claims that are made. Maralyn: How does mineral makeup work as a sun protector? 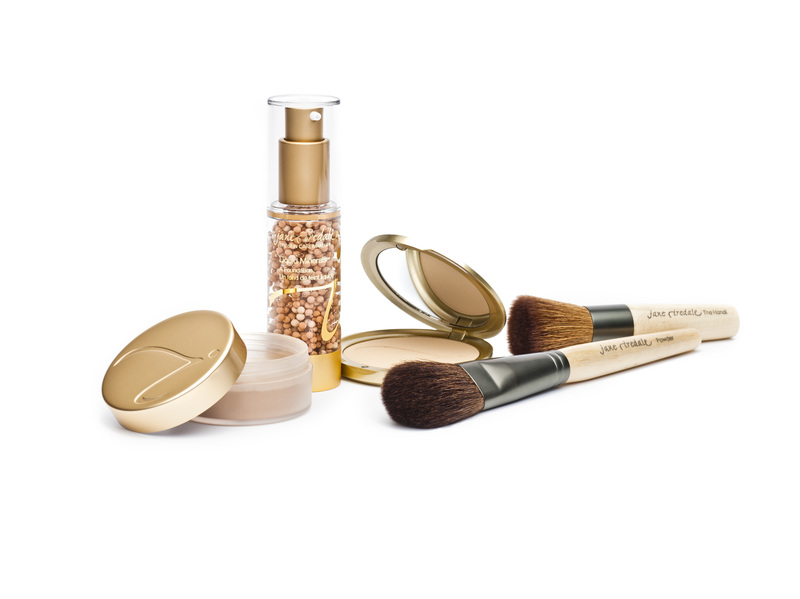 Jane: Mineral makeup offers physical sun protection, as opposed to chemical sun protection. The active minerals, titanium dioxide and zinc oxide, in our mineral foundations literally block UV rays by acting like tiny mirrors on the skin, reflecting and refracting rays. This differs from most chemical sunscreens which absorb UV rays. Once chemicals have absorbed their limit, the sunscreen ceases to be effective and may actually turn into free radicals that damage the skin. Sherrie: For those with allergy risks, how do your products rank? Jane: When I first brought out our mineral powders, I went to Santa Fe to work with a group of women who were seriously chemically sensitive. I remember so well walking into the room and one of the women said, “Are you using hair spray because I’ve just broken out in hives?” I had to do my demonstration with a shower cap on. However, all of the women were able to wear our minerals and their doctor gave us a wonderful testimonial. We test every product for sensitivity on 50 human subjects. Maralyn: I started four or five years ago with the Liquid Minerals foundation. If someone were to start with your products, what would you suggest? Jane: We’ve created new Starter Kits that make it easy to acclimate to the line. Each Starter Kit includes our loose foundation, pressed foundation, hydration spray, primer and a foundation brush, all in a chic travel cosmetic case with an extra large mirror. There are shades for every skin tone. It’s effortless makeup that actually improves the condition of your skin, which will boost confidence. Start there, and you will be amazed by how beautiful your skin can be! Sherrie: How has your line expanded over the years? Jane: This year, we are celebrating our 20th anniversary, which is an incredible achievement for the brand and the mineral makeup category. Over the past 20 years, we have expanded the line to include more than 400 products and we’re now available in 43 countries around the world. Sherrie: What do you see coming in the future development? Jane: We’re going to continue doing what we’re doing, but hoping to get better and better at it. We’re very engaged with spreading the word internationally and learning about markets that we haven’t yet opened. These are exciting times with new ingredients, new technologies and new ways of marketing them. Maralyn: You are obviously very busy at work with your mind going non-stop and I am sure you have a creative team, but you seem to take time for outside organizations. Do you have any in particular you would like to mention and why? Jane: I’m very interested in organic produce and fortunately I live in a community surrounded by organic farms. We have an organization here called Berkshire Grown that supports and encourages our farmers. My great treat on the weekends is going to the farmers’ market and seeing my farmer friends. I’m amazed at how hard they work and how they deal with so many challenges including the crazy weather we’re having lately. They are so dedicated to bringing the best possible food to the consumer. They believe as I do, that healthy food is the best medicine. I don’t mind paying more for their products because I know that I and the people I love are going to be better for it. Just think what this saves us all in medical bills! Sherrie: Can you share a little about your family/home life? Jane: I live and work in a town with 7,000 people in western Massachusetts. It’s not only beautiful but also a cultural center. There’s so much going on here that it’s really difficult to keep up. Sometimes I just want to sit in the garden with my husband, Bob, and our little dog, Cookie, and let the world go by. I love our garden. It’s full of flowers and organic vegetables. Last year we started keeping bees, so it’s always fascinating to watch them. But we have busy, busy lives, so these moments don’t happen very often. Maralyn: Is there anything I’ve missed that you would like to share with our readers? Jane: I feel so fortunate to be doing something that I love and that I’m able to share our products with the women who work for us and women world-wide. That kind of satisfaction is a true luxury and I’m forever grateful. On behalf of Sherrie and myself, we appreciated Jane’s interview. Now, we’ll share a little about what we use at home and what is quick and easy to travel with. I use the same for both. Recently, I noticed how much the product line had expanded and I talked with Sherrie about our testing some of the newer products. We could both see if they were as good as what I had used. Sherrie is more of a challenge, as she is allergic to many products, while I’m only allergic to a few. The company was nice enough to send some of what we didn’t have to let us test a few more items. Each product comes with complete instructions, plus there are videos on Youtube.com/janeiredale if you want further guidance. Pure Pressed®Base (mineral foundation with SP 20). Eye Steppes®, which is a small circular compact, with five shades of eye shadows. Sugar & Butter Lip Exfoliator/Plumper. Since my lips tend to be dry, the Lip Exfoliator end has organic brown sugar crystals (exfoliates), macadamia seed oil (smoothes, softens and soothes), and jojoba seed oil (hydrates and resembles skin’s natural sebum). You turn the other side for the Lip Plumper, which has Beeswax (antimicrobial protection), Shea Butter (moisturizes), and Palmitoyl Oligopeptide (stimulates collagen production and increases hydration, reduces furrows and enhances volume of lips). Pure Brow™ Brow Gel; my hair and eyebrows went with chemo years ago. Now, they are so thin they need help and this is the perfect solution that doesn’t look like a pencil line. Pure Gloss™ Lip Gloss to finish my lips. D2O™ Hydration Spray mists my face and sets everything. I know this sounds like a lot, but believe it or not, it all fits in a small 3″ x 5” bag with room to spare. Now it’s Sherrie’s turn to tell you about her make-up experience. Trying a new make-up line is a lot like skydiving without a parachute for me because I am extremely allergic to dyes, chemicals and fragrances. Marlalyn has been talking about how much she loves jane iredale’s make-up line for as long as I’ve known her. It is natural for her to share her love of the product, because most women love to share their face paint with their best of friends. Unfortunately, I’m not that kind of girl who tries on my girlfriend’s eye shadow or blush, simply because I never know how I’ll react to it. The aggravation of having to pump myself with Benedryl just isn’t my idea of fun. When the opportunity came along to test jane iredale’s line of cosmetics, I was hesitant, but I took the leap and I’m so glad I did! The folks at jane iredale sent me a variety of eye shadows, lips colors, foundation and other goodies. Lipstick is my favorite thing to wear and I love to change my color or gloss throughout the day. I even like to put on a pale color or gloss before I go to bed, just a little something to make me feel pretty before I drift off to sleep. Every tube of lipstick or gloss was a delight, from the packaging, to the feel of the stain on my lips, to the fragrance. The Just Kissed™ lip plumper is lovely in its slender gold tube. Your friends won’t even realize you’re plumping up, as you reapply a fresh coat to your lips. My final touch was a hint of Sangria lip gloss to give me just a little more shimmer. After testing out the lipstick, I tried the Pure Pressed® Base. I know you’re supposed to put your lipstick on last, but I know that lipstick is less of a threat when it comes to my allergies, so I went a bit out of order. The Prue Pressed® Base was so light and the coverage was spectacular and I like that it is SPF 20. I took a breath, waited a few minutes to see how I would react to the base and things felt fine, so I moved on to my eyes. WOW! The powdered eyeliner went on so smoothly and I didn’t have to mess with blending in my typical eyeliner pencil. I chose a Black/Brown color. Again, I cannot typically wear all black, due to the dye, and again I waited. Things were feeling good and I hit the eye shadows. I went a little crazy here and did one of my eyes in the Pure Pressed Eye Shadow in Silver Lining. It created a dramatic look for evening. Then I to enhance my green eyes I used the Eye Steppers goGreen shadows. That was a lot of fun, because I used green and dash of purple in the outer corner and I haven’t worn an eye color that wasn’t’ silver or brown in a long time. The final test was the JustKissed® lip and cheek stain. You won’t see me in blush because I just cannot wear it. The red dye is not kind to me, so I opt for the organic method and pinch my cheeks as needed. I opened the tube and applied a good amount to both cheeks and rubbed it in. Again, I waited and I became a daredevil as the day wore on…I slept in it all. When I woke in the morning, my face was clear of any reaction and still looking rosy. For me, it was a wonderful experience, taking the time to play around with make-up and not have to worry about the consequences. Well, perhaps my smoky eyes could lead to something dangerous…but I’ll never tell. Images courtesy of Iredale Mineral Cosmetics, Ltd.